The global sizing agents market is estimated to be USD 3.1 billion in 2018 and is projected to reach USD 4.0 billion by 2023, at a CAGR of 5.4% during the same period. The study involved four major activities in estimating the current market size for sizing agents. Exhaustive secondary research was done to collect information on the market, the peer market, and the parent market. The next step was to validate these findings, assumptions, and sizing with industry experts across value chain through primary research. Both top-down and bottom-up approaches were employed to estimate the complete market size. Thereafter, market breakdown and data triangulation were used to estimate the market size of segments and subsegments. In the secondary research process, various secondary sources such as Hoovers, Bloomberg BusinessWeek, and Dun & Bradstreet have been referred to, so as to identify and collect information for this study. These secondary sources included annual reports, press releases & investor presentations of companies, whitepapers, certified publications, articles by recognized authors, gold standard & silver standard websites, associations, regulatory bodies, trade directories, and databases. 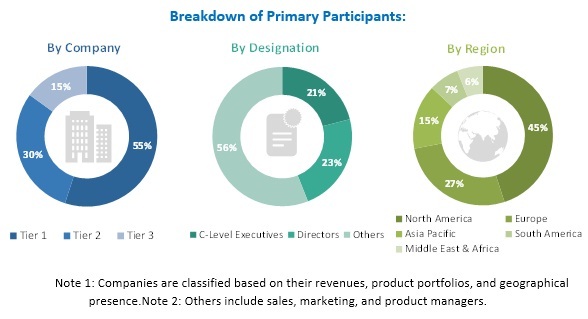 The sizing agents market comprises several stakeholders such as raw material suppliers, end product manufacturers, and regulatory organizations in the supply chain. The demand side of this market is characterized by the developments in paper & paperboard and textile industries. The supply side is characterized by market consolidation activities undertaken by paper & paperboard and textile producers. Various primary sources from both, the supply and demand sides of the market were interviewed to obtain qualitative and quantitative information. Following is the breakdown of primary respondents. After arriving at the overall market size-using the market size estimation processes as explained above—the market was split into several segments and subsegments. In order to complete the overall market engineering process and arrive at the exact statistics of each market segment and subsegment, the data triangulation and market breakdown procedures were employed, wherever applicable. The data was triangulated by studying various factors and trends from both, the demand and supply sides, in the paper & paperboard and textile industries. This report categorizes the sizing agents market based on type, application, and region. The global sizing agents market is estimated to be USD 3.1 billion in 2018 and is projected to reach USD 4.0 billion by 2023, at a CAGR of 5.4% during the same period. The growth in the production of textile & clothing industry and paper & paperboard products due to the demand for paper-based packaging is expected to drive the sizing agents market. By type, the synthetic segment is expected to be the largest contributor to the sizing agents market during the forecast period. The growth of the segment is mainly attributed to the demand for synthetic sizing agents such as polyvinyl alcohol and styrene among others. They are increasingly consumed in various applications such as textile & fiber and paper& paperboard applications. The above-mentioned factors are responsible for driving the demand for sizing agents during the forecast period. By application, the textile & fiber segment is expected to be the largest contributor to the sizing agents market during the forecast period. The growth of the segment is mainly driven by increasing global production of textile and clothing products. Furthermore, the various physical properties possessed by sizing agents help in strengthening of the yarn and impart abrasion resistance. The demand for sizing agents has increased owing to the huge textile production capacity and strong demand for textile and clothing. 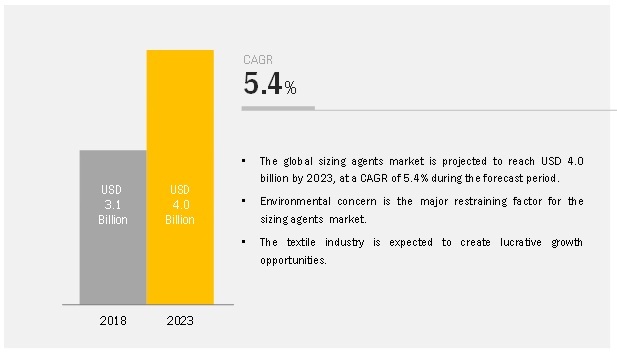 Moreover, expansion of automotive, aerospace, and medical industries and shift from the traditional low-value textile to high-value textile products also support the growth of the sizing agents market. APAC is expected to account for the largest market size during the forecast period. The growth of the market in the region is mainly driven by the shift of production facilities from North America and Europe to APAC. China, India, Japan, and Southeast Asia are the major contributors to the pulp & paper and textile & clothing production. APAC is one of the largest exporters of textile & clothing products across the globe. The growth of the packaging industry in the region, owing to increasing per capita expenditure on food & beverage and growing industrialization, is further expected to create the demand for paper-based packaging in the region. This, in turn, is expected to drive the sizing agents market in the region. Companies such as BASF (Germany), Aries Chemical (US), Pulcra Chemicals (Germany), Kemira OYJ (Finland), Solenis (US), Omnova Solutions (US), Buckman Laboratories (US), Seiko PMC Corporation (Japan), Evonik (Germany), and Bodo Moller Chemie (Germany) are the leading players in the sizing agents market, globally. Diversified product portfolio, high depth in application reach, and technical assistance to customers are factors responsible for strengthening the position of these companies in the sizing agents market. They have also been adopting various organic growth strategies such as expansion to enhance their current position in the sizing agents market. In January 2017, Kemira OYJ expanded the production of alkaline succinic anhydride (ASA) sizing agents in Nanjing site in China. These agents are used for improving water-resistance in the middle to high-end paper and in packaging board. The expansion will help the company expand its reach in APAC. Which are the future revenue pockets in sizing agents market? Which key developments are expected to have a high impact on the sizing agents market? Which product technologies are expected to cannibalize existing technologies? What will be the future product mix of the sizing agents market? What are the prime strategies of leaders in the sizing agents market?